An evening or dinner robe, of white muslin; with short fancy sleeve, appliqued with lace, and trimmed with a fall of the same article around the bosom. 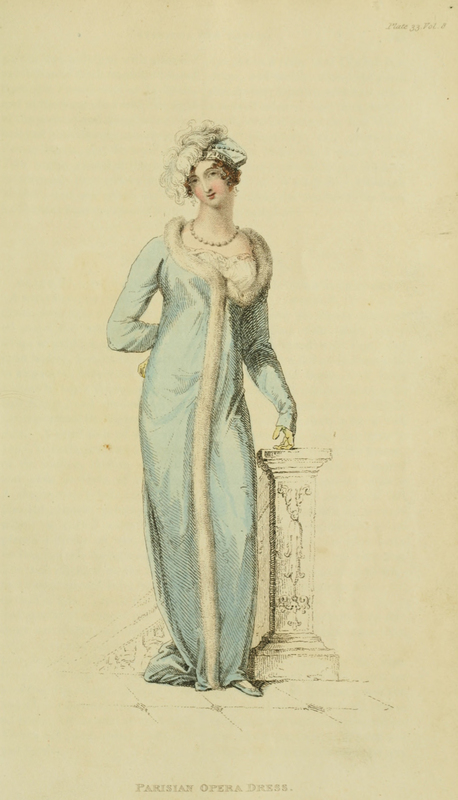 A loose robe pelisse, of celestial blue satin or velvet, trimmed down each side and round the neck with a full swansdown fur, and negligently confined in the center of the bosom. An imperial helmet cap, composed of blue velvet, ornamented with a silver bandeau and beads; a full white ostrich feather waving towards one side. “Negligently confined in the center of the bosom.” That’s what I’m aiming for with all my necklines. Love it! And yes, I want one, too. The sleeves and train are negligently long, too–I kind of like the studied sloppiness! Those aren’t the lyrics. That’s a cheap trick. I do love the way it negligently reveals one breast. . . I’m sure I’d make a big hit on campus if I wore that to meetings! That’s about what I was thinking. Especially when doing inquiry-based learning in bring-your-own-device classrooms, I need necklines that will accommodate a good deal of leaning over to try to see what is on students’ screens without accidentally flashing anyone.